Gov. Bill Walker announces his administrative order on climate change at a news conference on Oct. 31, 2017. Gov. Bill Walker signed an administrative order today to tackle climate change in Alaska. 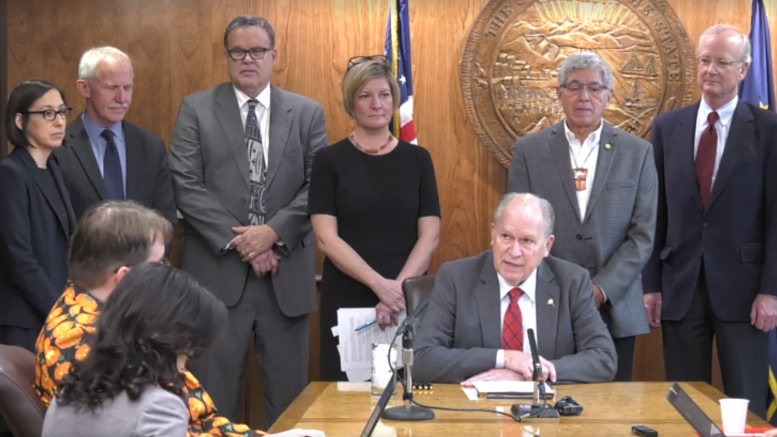 The order creates the “Climate Action for Alaska Leadership Team,” which will include 15 public members along with officials from state government. The group will be tasked with producing a report by Sept. 1, 2018 on proposals for mitigating carbon emissions and adapting to the changing environment among other goals. The governor said it’s critical for the state to launch its own efforts to combat climate change because it’s already feeling the impacts first-hand with rising sea levels and shifting coastlines. Several groups approached Walker in hopes of cobbling together a nationwide response in the wake of President Donald Trump’s announcement of the withdrawal from the Paris Climate Agreement, but Walker said he ultimately favored an Alaska-grown response. “Most importantly, we’re reaching out to Alaskans to bring the best of Alaskan leadership into this effort,” he said. With competing interests between the development of fossil fuels and climate change goals, Walker said he doesn’t plan any policy changes on resource development. He said, however, that some of the policies, particularly around mitigation of the impacts of climate change, could be funded with resource income. Walker’s climate change policies have long been in the works. At his State of the State address earlier this year, he said Alaska is already feeling the impacts of climate change, but recognized the challenge of balancing Alaska’s competing interests. Trump announced he’d be withdrawing from the Paris Climate Agreement, an international plan for countries to voluntarily reduce emissions in order to reduce the global average temperature to near pre-industrialization temperatures, earlier this year. The withdrawal spurred many cities and states into action to adopt the goals of the Paris agreement to reduce carbon emissions and to promote renewable energy. A new report by the United Nations Environment Program says the gap between current trends and the Paris Climate Agreement’s goal is huge (and it’s not just because of Trump’s withdrawal). Earlier this year Walker also appointed Nikoosh Carlo, who’s Alaska Native and from Fairbanks and Tanana, to a newly created position of senior climate adviser. She previously worked as the director of the Alaska Arctic Policy Commission and with the U.S. State Department’s Arctic Council delegation. Three of Alaska’s biggest cities took steps to commit or recommit to taking action on climate change in wake of president’s withdrawal from the accord. Anchorage Mayor Ethan Berkowitz and Fairbanks North Star Borough Mayor Karl Kassel signed onto Climate Mayors, a coalition of of 382 mayors who’ve signed onto a statement seeking to uphold the goals of the Paris Climate Agreement. The Juneau Assembly voted 6-3 in August to approve its own climate change resolution that reaffirmed support for a 2011 Juneau Climate Action and Implementation Plan, though the Juneau Empire reported it didn’t include any direct mention of the Paris Climate Agreement or President Donald Trump’s withdrawal from it. Be the first to comment on "Alaska Gov. Walker announces Paris Agreement-esque plan for climate change"